Nissan's GT-R is expected to pack over 500 horsepower. 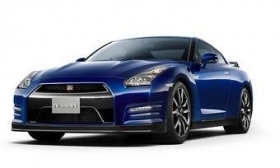 The 2012 Nissan GT-R debuts today in Japan and will hit North American soil in November at the Los Angeles auto show. The GT-R, Nissan's high-performance model, receives a refreshed interior and exterior. Nissan is calling the car a 2012 model. Sales begin here in early 2011. AutoWeek, an affiliate of Automotive News, says the car likely will pack more than 500 hp. The car's aerodynamics are improved due to a restyled front air dam. The car also will feature carbon-fiber inserts in the grille, new brake-cooling ducts and LED daylight running lights.